With having two special needs children in our home, we prefer to use products that are free of nasty chemicals and tend to use natural products as much as possible. When I discovered ATTITUDE products I was quite intrigued. ATTITUDE is a eco-friendly Canadian company based in Montreal, and their products are manufactured using 100% renewable energy and they plant trees to compensate the inevitable greenhouse gas emissions. They use HDPE #2 plastic for their bottles because this is the easiest plastic to recycle. Bottles are pre-washed, crushed into flakes or pellets and washed again. These flakes and pellets can be used to produce new packaging or new products. Their products are free of colors or dyes. They do not test ingredients or finished products on animals. Their products are free of cancer causing contaminant and other chemicals. ATTITUDE sent me a selection of their products for my family to tryout. Getting all the stains out of my daughters clothes can be quite a challenge at times as she has a love for chocolate ice-cream, but I was impressed on how well it clean our clothes considering that I did not use any stain removers. One thing I dislike more than anything else is static build up! This fabric softener has a pleasant scent thats not overpowering, and my clothes came out of the dryer feeling soft and fluffy. I used this floor cleaner on all my wooden & tiled floors, It has a pleasant scent left my floors streak free and even my wooden floors shined after I was finished. With having young kids in the home, they constantly leave sticky fingerprints everywhere. So my windows and mirrors always need cleaning. I did find this window & mirror cleaner a bit bulky to handle, but it did a wonderful job at cleaning my windows & mirrors and left them smear free. I just love the scent of this dishwashing liquid, you only need to use a small amount to get your dishes squeaky clean, and no grease residue was left behind. My youngest daughter finds my hand soaps very hard to pump, and she usually gets very frustrated. She was able to operated this foaming hand soap all by herself and she enjoyed the scent. I have dry hair and need a shampoo & conditioner that will work hard to keep my hair well moisturized. The shampoo lathered up really well and did a fantastic job at cleaning my hair. The conditioner left my hair feeling soft and well conditioned. I only used a small amount of the body wash on a exfoliating bath scrub, It lathered well, and left my skin feeling refreshed and soft. Become a ATTITUDE Member & Save up to 50% on Regular Prices. Enjoy the 90-day free trial and start saving today on the best baby, family and home care products delivered right to your home. 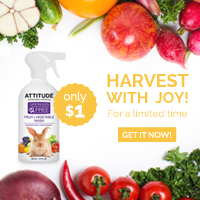 ATTITUDE Products are also available at most grocery stores and drugstores across Canada. Have you tried any of ATTITUDE’s products yet? I haven’t tried it let alone heard of it. Thank you for the great review! the green apple and basil would be a great scent! I’ve been doin my best to be more green. Now to get all these chemicals out of the house! These seem like awesome products, I’d love to try them out! Thank you for this great product review. If you wish to purchase these products, you may do it online directly from the manufacturer website http://www.cleanattitude.com.